PARIS, France , Dec 8 2015 (IPS) - 53-year old Aleta Baun of Indonesia’s West Timor province is a proud climate warrior. From 1995 to 2005 she successfully led a citizens’ movement to shut down 4 large marble mining companies that polluted and damaged the ecosystem of a mountain her community considered sacred. After their closure in 2006, she became a conservationist and restored 15 hectares of degraded mountain land, reviving dozens of dried springs and resettling 6,000 people who were displaced by the mining. On Monday, on the eve of the Gender Day at the ongoing UN Climate Change Summit (COP21) in Paris, Baun who is better known as or ‘Mama Aleta’ in West Timor, had a strong message for the negotiators: for a climate deal to be effective on the ground, it also had to be gender equal and recognize women’s climate leadership. Running a landscape restoration project is costly. Baun has so far spent about 50,000 dollars pooled by community members and local NGOs. The project needs much more for completion. But this is a challenge as official funding has not come forth. This dismays Baun who feels that although women were setting great examples of climate leadership, it is not officially recognized by governments and international policy makers. For example, she said, there was no official communication between the Indonesian delegation of negotiators at the COP and grassroots women climate activists like her. “We don’t know who the negotiators are and we don’t know what they are negotiating. We feel that we, the indigenous women, are alone in this fight against climate change,” she said. “The purpose of the many sections is not clear. Also, some crucial components are missing. For example, gender equality is there, but indigenous people are not. One very important thing is inter-generational equity. For us, this is a core issue and it’s really not clear,” said Sabina Bok of Women in Europe for a Common Future. Farah Kabir, head of ActionAid in Bangladesh agreed as her country has been hit by extreme weather events like flooding and sea disasters that have affected millions of women from poor communities. “The draft policy has lack of clarity on several of these points,” she said. 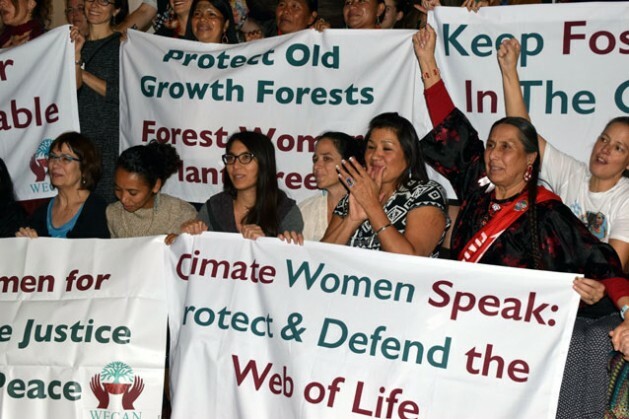 Presently, the key demands of most women leaders at the COP21 included commitment by all governments to keep global warming under 1.5 Celsius to prevent catastrophic climate change, including in all climate actions the recognition of human rights, gender equality, rights of indigenous peoples and intergenerational equity and provide new, additional and predictable gender-responsive public financing. The United Nations Framework Convention on Climate Change (UNFCCC) estimated that women comprise one of the most climate vulnerable populations. As the impact of climate change on women grows bigger, the vulnerability of women across the world is also growing and there is a sheer need for allowing women greater access to renewable technologies, said many. However, these technologies also had to be safe and gender responsive, so that they responded to both the daily and different needs and priorities of women. Alongside, investment is the need to train women in how to use these technologies. Investments are also needed to facilitate women’s leadership in both mitigation and adaptation measures, said Neema Namadamu, a women leader from northern DRC. “In Congo, women are busy planting trees to help re-grow our rain forests. First, we need assured investments into initiatives like this that is a direct flight against climate change. The hair-splitting negotiations can continue after that,” said Namadamu, founder of Mama Shuja, a civil society organization that trained grassroots Congolese women in climate action and fighting gender violence using digital media tools. However, to ensure women’s greater access to climate finance, renewable technologies and adaptation capacity, the climate draft needed to have a sharper gender focus, felt Mary Robinson, former Prime Minister of Ireland and one of the greatest women climate leaders. “There will be a climate deal in Paris. It will not be a ‘great’ deal, but a fairly ambitious one. But its extremely important to have a climate agreement that is ambitious, fair and also gender-fair. We definitely need an agreement that will exhilarate more women’s leadership. If we had more women’s leadership, we would have been where we are now,” Robinson said. 01. Will COP21 ensure Cultural Revolution? 02. Are we searching midterm solution? 03. Are we in time Killing? 04. Do we need comprehensive plan? 05. Do we really responsive to our next generation need? 06. Will COP21Answer —Killing, Shooting, Looting, Migrating—-Terroring? 08. Do we planned to include all in fighting Climate Threat? 09. Do we on the way to establish Consumption Justice?